Xiaomi Mi3 is coming as a surprise gift to the Mi fans today on Oct 6th, where Mi3 will be added to your cart automatically, if you registered for Xiaomi Mi3 more than 5 times previously and failed to get the apple of China “Xiaomi Mi3”. 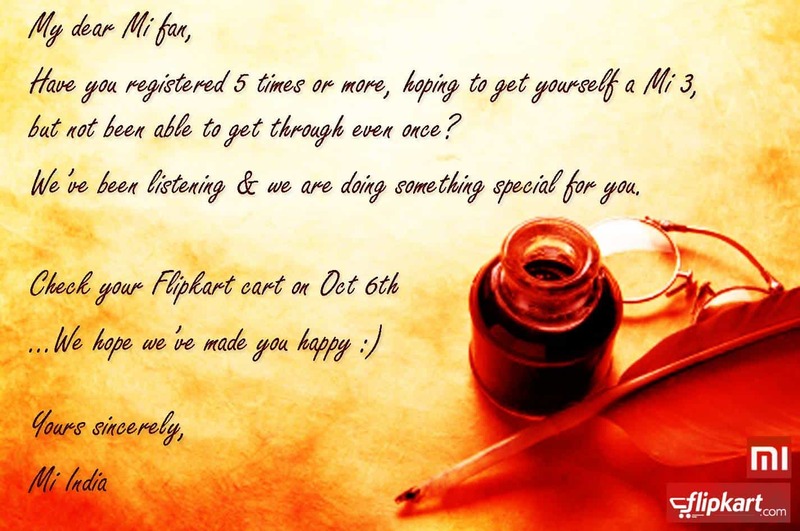 If you are not lucky to get the auto Xiaomi Mi3 loaded in your shopping cart, then there is other good news for all Mi Fans. The Chinese smartphone maker Xiaomi will put 25,000 Mi3 devices directly into shopping carts of as many Mi fans who have made more than five unsuccessful attempts to buy it on Flipkart, as the company prepares to lure customers on the festival season of diwali. According to Huga Barra, a new system of sale, will help the Mi fans to get the Mi3 device directly into your cart, without the need to wait for the sale or use different hack tricks like “Best tips and tricks to add Mi3 directly into your shopping cart“. They termed this system of selling Mi3 to the value added customers is “Xiaomi Priority Pass“. Xiaomi Priority Pass, will be given only to people who have been trying repeatedly to purchase the phone in the past, but have been unable to do so. For these users, there will be a special priority sale, where the phones will be automatically placed in their shopping cart on Flipkart. To go through with the purchase, the buyers need only complete the billing process. The number of handsets being allocated for the priority sale is around 25k units, and the company is apparently still working over the modalities of the priority pass with Flipkart. Hugo Barra also spoke on a few other topics, including the fact that the return rate for Redmi 1s is one percent. He added that Xiaomi has been calling customers who have been leaving one star ratings on Flipkart as part of their India focus. According to him, Xiaomi will also hire Indian engineers in the future, to work on the UI for proper localisation, and the company is also gathering crowd-sourced translations of Indian languages to help localise the UI.